A Transarea Symposium, organized by Gesine Müller (University of Cologne), Ottmar Ette (University of Potsdam), and the Global South Studies Center Cologne (Center of Excellence), in cooporation with the Departments of Romance Studies of the Universites of Cologne and Potsam, Hoch­schu­le für Musik und Tanz Köln – In­sti­tut für Welt­mu­sik und trans­kul­tu­rel­le Mu­sik­for­schung, DFG − Emmy Noe­ther Nach­wuchs­grup­pe “Trans­ko­lo­nia­le Ka­ri­bik”, CA IV: Cul­tu­res and So­cie­ties in Tran­si­ti­on, POINTS Pots­dam In­ter­na­tio­nal Net­work of Transarea Stu­dies. International Conference organized by Ottmar Ette (Universität Potsdam), Veronika Sellier (Migros, Zürich), and Yvette Sánchez (Universität St. Gallen). The conference will be held at the cultural centre and artists residence L’arc – Littérature et atelier de réflexion contemporaine in the Swiss town Romainmôtier. 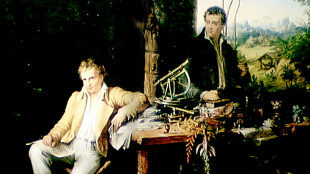 The Alexander von Humboldt in English (HiE) research group will meet at the Universität Potsdam, Germany, for a public workshop. There will be four presentations and group discussion. How is the cultural space of the Andes perceived by the politics, the societies, and the scholarship of the different countries in the Andean region? As the ones who have mainly shaped the transnacional character of the cultural Andean space, where do the indigenous communities fit in? How can this cultural space be modeled, (re)constructed, and be filled with life? Ottmar Ette, Chair of Romance and Comparative Literature at the Universität Potsdam, was recently appointed as member of the Advisory Board at the Bayreuth Academy of Advanced African Studies. The Bayreuth Academy of Advanced African Studies is an inter- and transdisciplinary research institution at the Universität Bayreuth, Germany. It started its operations on October 1, 2012, focusing on “Future Africa – Visions in transformation”. The research focus “Future Africa” has a duration of four years (2012-2016) in its first stage and receives financial support from the Federal Ministry of Research and Education. El Caribe nos puede enseñar de entender la literatura desde unas lógicas relacionales, de entrecruces. Al mismo tiempo tenemos que desarrollar nuestros métodos y conceptos teóricos de una forma móvil, desarrollar nuevas pautas de investigación y de interrelación científico. 2:15 p.m. - Keynote by Enrico Mario Santí (University of Kentucky, Lexington) entitled “El paradigma, o la paradoja, del Caribe”. Mi ponencia se va a dividir en tres partes: 1) Observaciones generales sobre el Caribe como paradigma 2) Una reseña extensa de “La Isla que se repite” de Antonio Benítez Rojo 3) Abrir el tema hacía algo quizás imposible. Quizá el Caribe de hoy - como el primer “melting pot” de la historia - ofrece al mundo no sólo un modelo de creolización (Glissant) sino también un reto ya que los conceptos culturales que se han generado desde allí, frente a una economía globalizada, están en un momento de crísis, de auto-cuestionamiento. This workshop-conference was presented by the inter-institutional project “Circulation of Knowledge. Transregional Studies” by the Institute for Advanced Studies, Berlin in cooperation with the Research Network ForLaBB (Forschungsverbund Lateinamerika Berlin-Brandenburg).